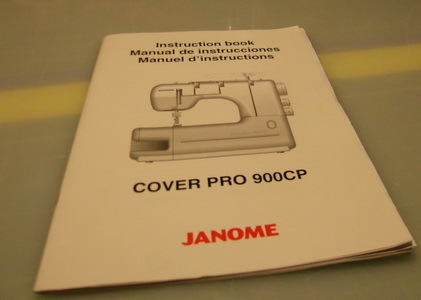 A work book for the 900CPX Cover Stitch machine. I have to blame Stitchers Guild for the acquisition of a cover stitch machine. That site has cost me so many $$$. I mean that in a good way. I’ve wanted to spend money on sewing but other than fabric couldn’t find much that captured my attentions. Through the posts at SG I’ve been encourage to upgrade my machines, add many tools including this cover stitch machine, shop on-line for fabric and try many fabric manipulation and embellishment techniques. Whereas my embroidery machine used to run non-stop on weekends, it now runs about once a month as my attention is focused on other things to do with fabrics. I don’t regret spending the money. I wish I could have found these like-minded individuals years ago. Then I promptly went through all the links gathered from SG posts and pulled up Debbie Cook, StitchesandSeams, All The Stuff page. I printed it out. I wonder if Debbie was a technical writer. Her instructions are just that good. Even though she was working with and writing about her BLCS, by following the her instructions I was able to get my CS hemming beautifully. That did mean though that I had accumulated a few more pages. This was good for the next 6 months. During that time I was satisfied to hem at the CS. Then I decided I wanted the CS to do a little more. I started experimenting. Making samples and accumulated a little more stuff for the folder. 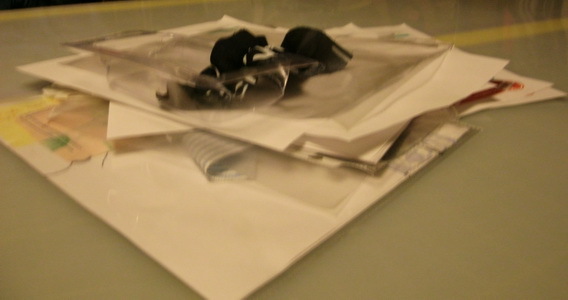 Then I purchased two accessories and acquired both the manufacturers minimalistic instructions and some bubble packaging. I’ve not had this machine a full year, yet I’ve managed to acquired a big pile of……. stuff!The folder is no longer sufficient at holding everything. 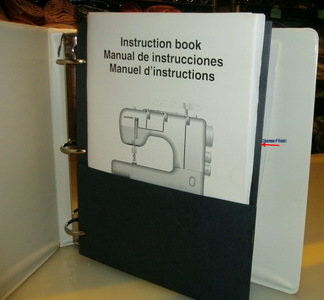 So I’m turning to a 2″ binder and also creating a workbook for my specific machine the 900CPX. I’m a real believer in this. I often have people say to me “you’re so creative”. Thank you, but I don’t feel I’m that special. The difference between me and them is that I take the time to really explore my machine. I spent days with my HV Ruby (sewing machine) just stitching out the built-in stitching. I adjust length and width; tried different fabrics and threads. I did the same thing with the HV S21 (serger). Then I put that information in a workbook just like I’m building now for the CS. I’m often inspired by RTW and know that I can create something very similar because it’s already in my workbook. When I see something I’d like to duplicate, straight to the workbook. OK so I’ve done this before and as usual I started by creating a spline and front cover for my binder. I’ve done this many times before. I used to make these kind of things for work. I add things that you shouldn’t even worry about. In fact, the work book is for me. I’m suggesting that a similar process of sampling, making notes and keeping both could be helpful to you but in no way am I insisting that you ought to or should do the same. Everyone works differently and you should do, what is best for you. For myself, a nice big binder, with labels and pictures is helpful. 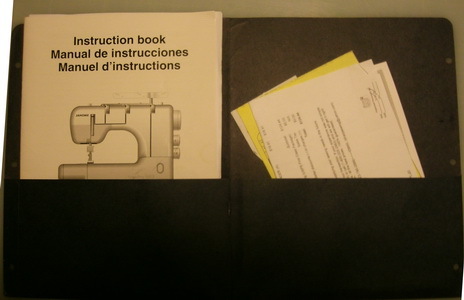 before folding it inside out and inserting the Users Manual on one side (the side I’d see first when opening the binder) and all the receipts on the other side…. 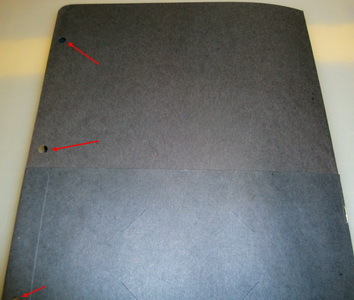 … and placing it inside the binder. I still have a big ol’ pile of stuff. As the days/weeks/months go along, I plan to document each technique I use or experiment with, share on this blog and then arrange inside my binder. Do you have a list of the accessories you have? I see some that say they will fit but have been leary about buying them becuase I am unsure. Veronica, You commented twice so I’m answering twice. I have the clear foot with center guide foot, Adjustable Seam Guide and Hemming guide all from Janome and all purchased at Kens Sewing center. These work perfectly. They’d better. Janome certified them and charged a lot of money for a few small pieces of metal and plastic. I also have two generic binders and and adapter plate but I haven’t got them working. I just don’t have enough experience to understand what I’m doing wrong. I get them on the machine but can’t bind a dang thing. When I’m successful, I’ll post my user experience and a source. The generic accessories are significantly less in price. I sometimes feel a bit of resentment towards the brands (Janome Babylock Bernina). It’s like they’ve decided anyone who buys today’s machines are fat rich cats and they (the brands) are entitled to squeeze us for every penny. So if I can get these working, I’ll be glad to keep a few $$$ in my on wallet. 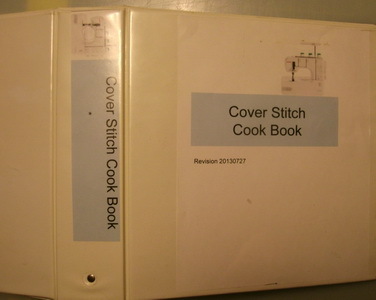 I hemmed and hawed about buying a coverstitch machine, but between you and the Craftsy course I took, I took the plunge–Brother 2340CV and all the accessories at allbrands.com. I’d had it on my wishlist for at least a year, but watching Angela Wolf use the same model with those binding feet sold me on it. Was that the Craftsy course you took, or was it something else? I’m really pleased with it for topstitching, hemming, and chainstitching. I haven’t had a chance to try using the binding stuff yet. I took “Creative Serging Beyond the Basics” by Angela Wolf. I do believe we took the same course. 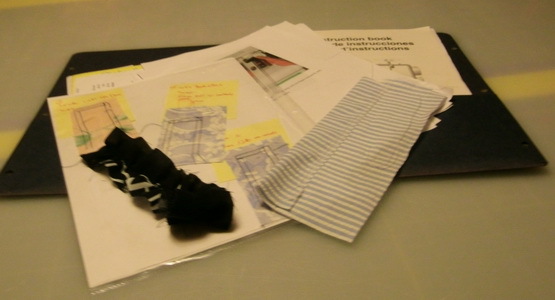 First off she has me drooling for the adjustable blind hem foot for my serger, reminded me of so many things I’ve forgotten could be done and I think her illustration of binding is going to solve my issues. Haven’t tried at my machine yet. I want to get this workbook synched up with what I’ve already learned. I was looking hard at the 2340CV. The price was right. The major accessories were all there. Especially loved the way the accessories just snap into place. However, most of members at SG discouraged me from making that purchase. I’m not sure why, but over all there was a negative vibe towards the Brother machine. Just before I purchased I called my dealer to see if they could help. I really thought I would need help. 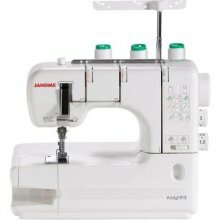 In way I wish I’d gotten the brother (those snap on accessories) but then I do know that Janome’s are well built and while I haven’t needed help, the dealer will still give me help and will service the machine. In fact, my first servicing will be free. There used to be a terrific site about the 2340. But the owner took everything down. Not sure what that was about. I’ve almost given up blogging myself because there’s a lot of hate circulating out there. Instead I’ve gone the route of requiring that commentators identify themselves and any post that askimet says is questionable is deleted. Still I wish that site were available. You’ll be able to figure out how to use your machine. It would have been easier had those posts and pictures been available. Really, compared with the coverhem functions on the Juki, the 2340CV is a walk in the park. The Juki is a great serger, but I have to spend a long time fiddling with the tension once I get it threaded for coverhem stitches, it’s particular about what sorts of knits it will hem, and it’s hard to see where I’m stitching. I guess one machine can’t do everything well. Maybe practicing with the Juki coverhem functions was good practice. Sorry to hear about the bad vibes with the sewing community. It seems like, once a community gets big enough, it attracts trolls. I’ve seen it happen in tech groups, online music groups, literature groups. It goes from a supportive band of like-minded individuals to a public space where a few people feel free to misbehave. Anyway, I appreciate reading your insights about sewing and sewing technology. I got a lot out of the “Creative Serging” course. When I first got the Juki, I tried lots of its fancy functions, and most of them looked awful, so I went back to the basics. Now I’m inspired to try again, and adjust and tinker until I get good results. I am an Allbrands customer. Can’t complain about them other than the return policy is stringent. It does sound like you are even further away from civilization than I. I’ve read of some Canadians who have to mail off their machines if they need service. Needless to say, annual service to dust and clean isn’t high on their list of priorities. I think with Brother you get what you pay for. I have a high end knitting machine that is wonderful. It’s over 15 years old and never needs more than my dusting and cleaning. OTOH I’ve had Brother calculators that didn’t last a week and my first serger, a brother, was returned within 6 weeks time for broken parts. When someone I’m friendly with says “what are you even thinking of” I tend to listen. It sounds like the voice of experience. Don’t let that put you off your CV. The price points are right there, in line with the Janome and Elna. I think the BLCS is much higher mostly because it has the vacuum threading. Price and name is not a guaranatee of quality. I have a friend through the sewing club who is looking to replace her Babylock serger. The vacuum threading quit and the dealer said there was nothing they could do about it. Having paid a premium for that Babylock and having it practically unusable, she’s not interested in a second. You know, you do get used to the adjustments your machine needs. I had a Janome 634D serger with tensions that needed to be reset for every function, every fabric. Even the change between single layer and double layer needed adjustment. (I bought it from Allbrands too.) After a while I didn’t even notice. I made the changes without thinking. In fact it was so odd when I got the S21 and it never needed adjusting. I’ve changed the differential feed a few times and the stitch length whenever I want something different. I prefer the 6.5 cutting width so that’s my personal default. Point is, if you work with your machine and get accustomed to what it needs to do the job, well it doesn’t seem like a big deal. It seems like business as usual. I have also been looking at ebay for feet, but on the one it says you might need an extension plate do you know what that is? Yes! I probably purchased the same or nearly the same items. The extension plate screws into the forward area and provides a place to anchor the binding accessories. Those things are big. Like really big. Like DANG big. More than a handful. I’ll see if I can get you a picture. Still haven’t tried to work with my binders. Do you know which binders you want? Did you read Debbie Cook’s discussion of A and B binders?